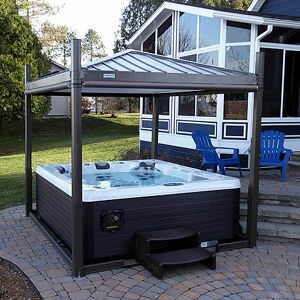 If you want to make sure your hot tub looks great in your backyard, a hot tub gazebo is the best way to go, and it keeps you shady in the summer. Who doesn’t love relaxing in a hot tub once in a while? It’s excellent when you get to do it at a hotel or spa or even at the gym, but what if you were able to do it whenever you wanted? For some lucky people that’s a reality because they have a hot tub in their own home. But what would make your hot tub even better and a great asset to your yard? 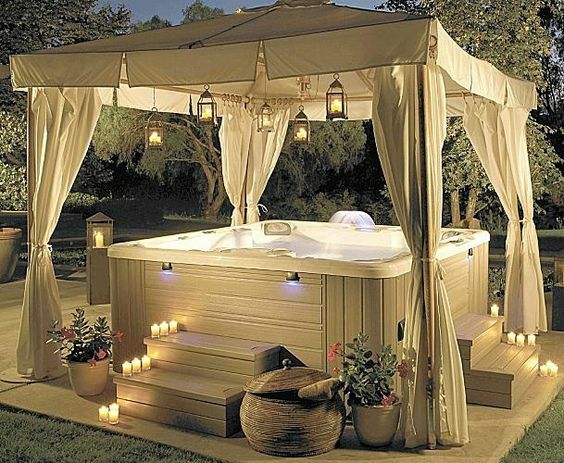 A hot tub gazebo. 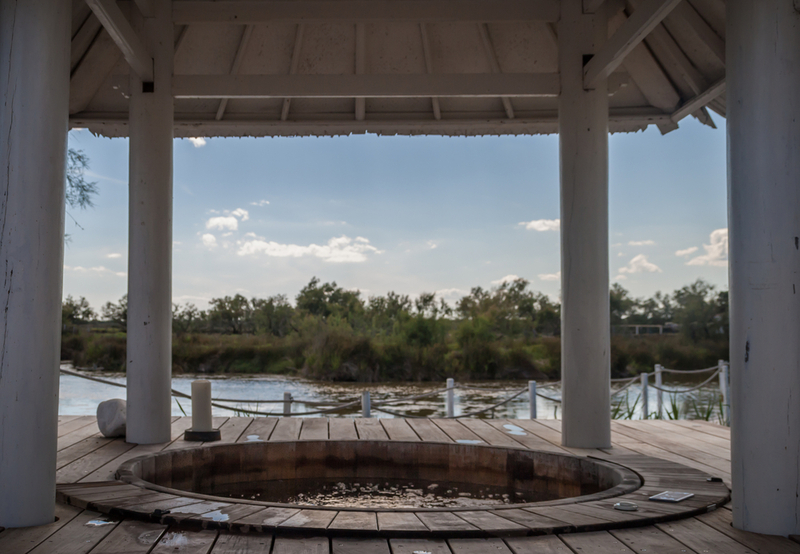 There are plenty of different styles and options when it comes to picking out a hot tub gazebo. That’s because there are so many different ways to make a gazebo and people keep coming out with more and more. Why would you want to settle for something just like everyone else has when you could get something totally unique? What you really want to do is look at all the options. 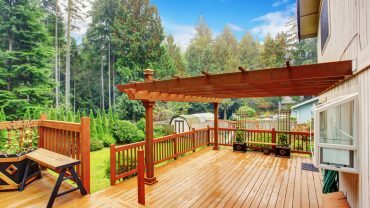 Sure, you can head to just about any store and pick up a gazebo that is made of plastic or composite or wood or even wire and metal. These gazebos are generally easy to put together and easy to get installed. You can also hire someone to make a custom gazebo or you can make one for yourself. The best thing about gazebos is that there is no one way to do it. 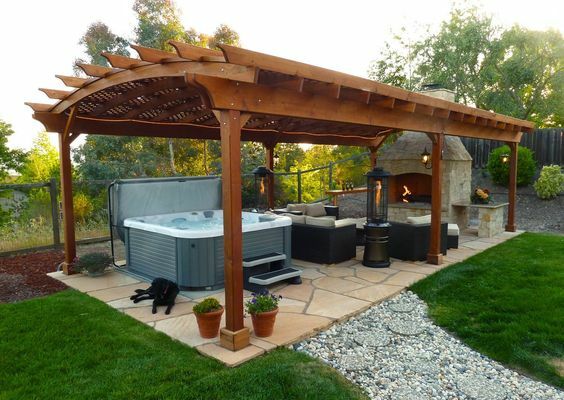 Basically, a gazebo is a structure that will stand up, over your hot tub. The true definition is that it’s a structure with a roof that lets you see the surrounding area. So anything you build or have built could be a gazebo. So get creative with the process. 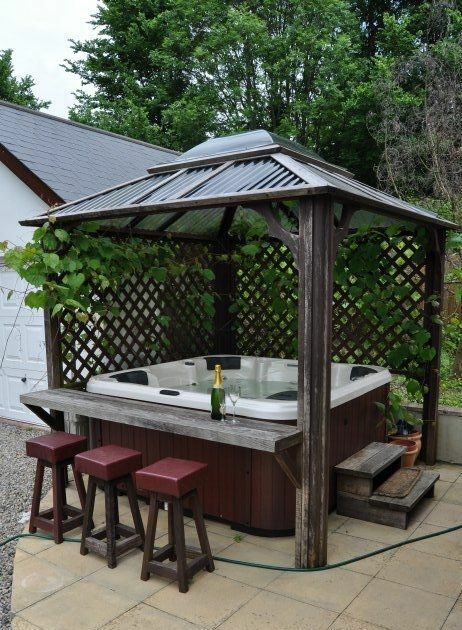 So what’s it going to cost to put in a gazebo for your hot tub? That’s going to depend on a few things. The first thing it’s going to depend on is where you’re getting the gazebo. If you’re picking up something at your local hardware store you may spend a couple hundred or maybe even a couple thousand dollars. If you’re heading to a specialty store you may pay a little more. On the other hand, if you get something made special you’ll spend the most. For something custom made you could easily spend upwards of $1,000 and many people spend upwards of $4,000-$5,000. In fact, some even have spent upwards of $10,000 for a gazebo. It all depends on what you want to get out of it. That means the size as well as the design. 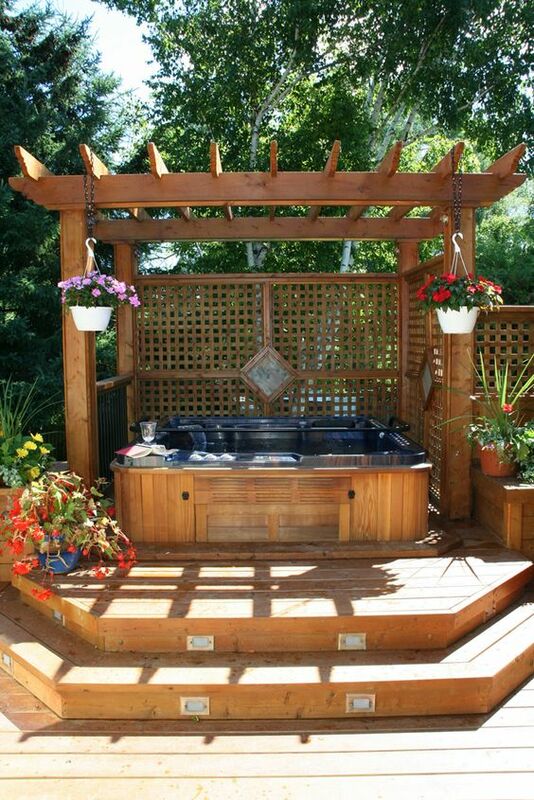 Just because your gazebo goes over your hot tub doesn’t mean that’s all it does. And maybe you have a large hot tub. There are plenty of factors. No matter what you think you’re looking for, there are plenty of gazebos out there and we’ve found some of the best right here. 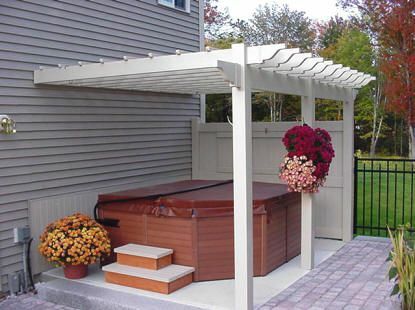 You’ll be able to get your gazebo up in no time and you’ll be enjoying it from your new pool too. So why not give things a go and see what choices you have? With this gazebo you get a little bit of opening all the way to the sky, but enough of a protection to keep you out of the elements. The oversized bamboo ‘legs’ definitely make it feel more beachy and tropical as well. 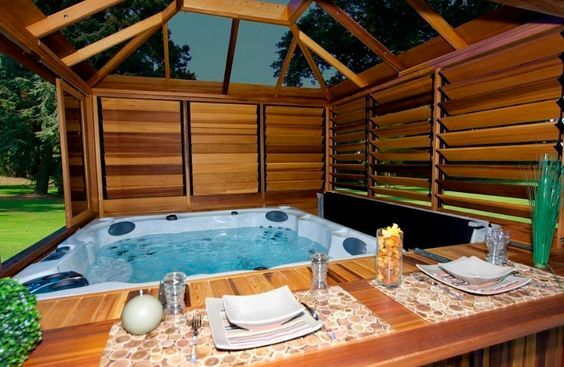 This hot tub gazebo is a little bit different and really only opens out on a couple sides. It has slatted blinds on two sides and open glass on the third along with an open window for the bar so it’s definitely going to get you space. This wood gazebo is a little more rustic but it’s definitely something unique because you get a bar, elegant style legs and a trellis on the back to grow your favorite vines as well. 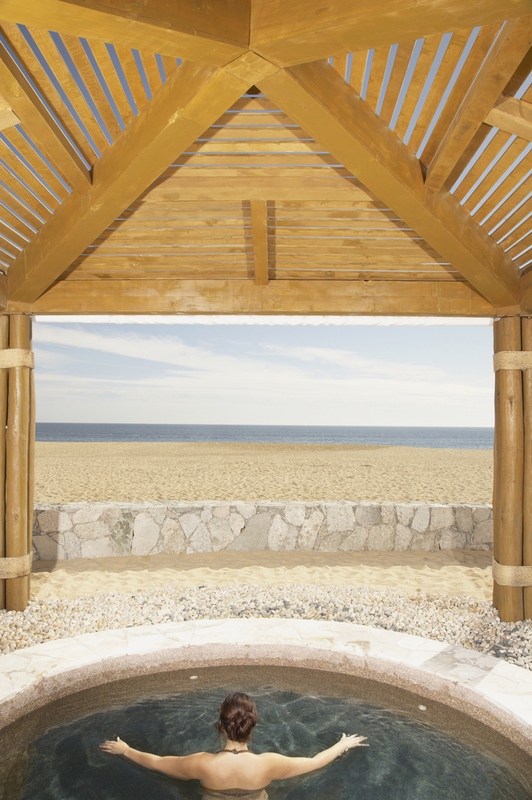 This gazebo is just enough to keep you covered from the weather. 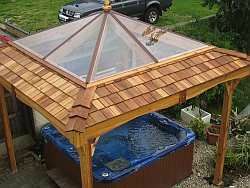 Even better, it has a glass cover so you can see the sky while you’re relaxing in the outdoors, plus the wood shingles look great. 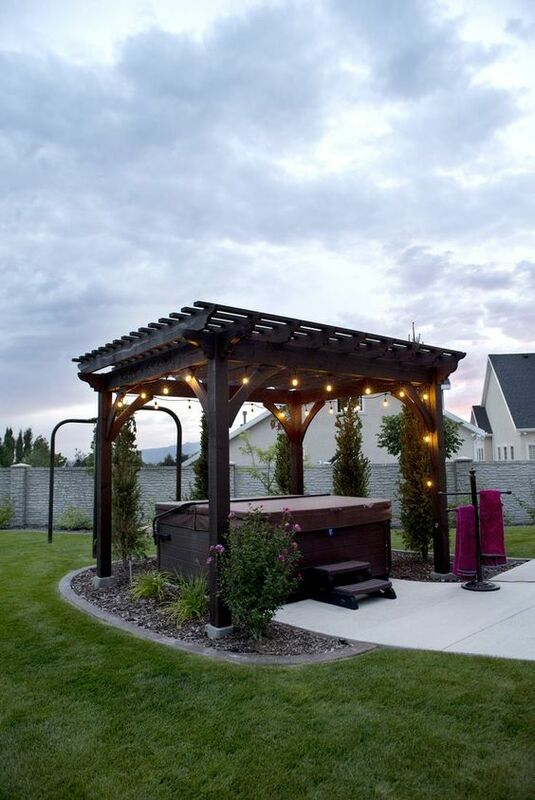 This gazebo is definitely a sweet look and it lends an elegant style to your backyard. It is light in color and has a trellis style side with a bar on the other and a solid back so the front is open. 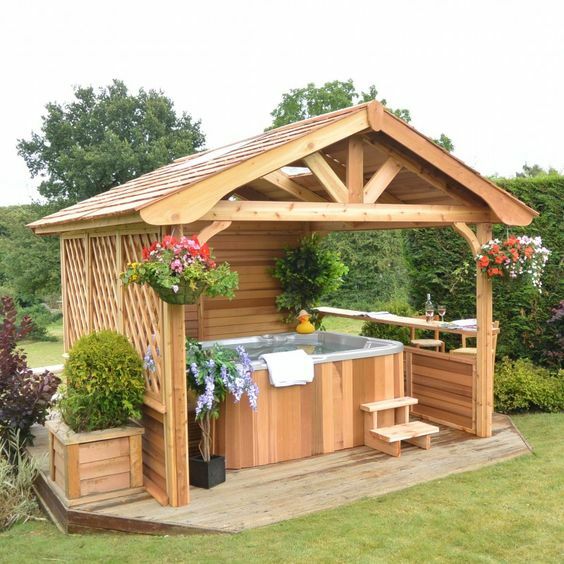 This gazebo has plenty of space for the hot tub as well as a fireplace and some chairs so everyone can relax at once. It also has a unique roof that’s definitely fun for anyone. This gazebo is a little different because it has tinted glass on a couple sides and openings on the other sides. Plus it has a bar on the side. 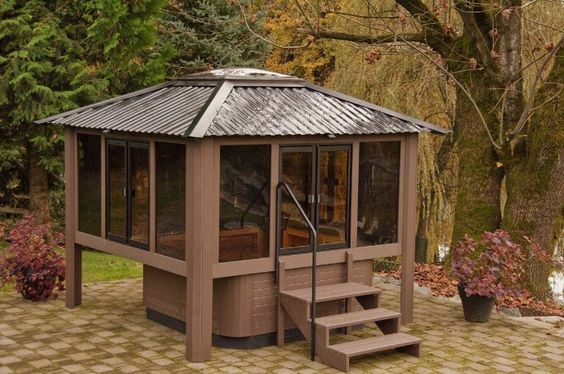 With the metal roof and the wood surround you definitely have a stable and sturdy structure. 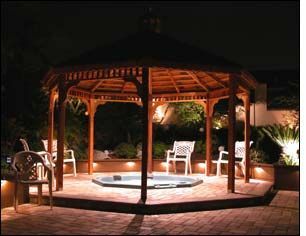 This is a beautiful gazebo with dark wood and a little bit of lighting to make it ideal for the night. 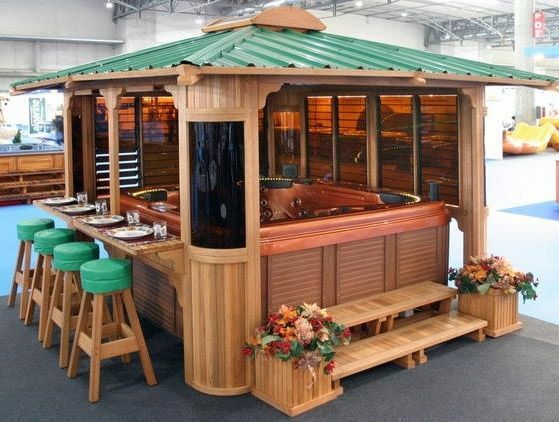 It’s a standard style gazebo, so you’re definitely getting what you would expect for your yard. The light color here with the trellis style on the sides means that you get plenty of ability to see everything. Plus the stairs from the deck make it really stand out in the backyard. 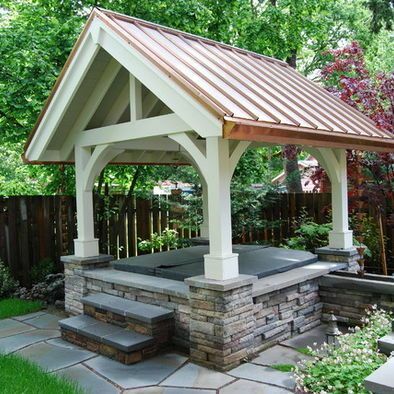 This gazebo actually looks like a wishing well because it has the stone base and a wood and metal cover. It’s a very fun experience and it’s definitely a great hot tub to be relaxing in too. The hot tub gazebo here is attached directly to the side of the building, which is great for anyone who wants their hot tub directly by their house. It’s also a standard look with a white wood. This gazebo is made with cloth, which is less expensive but still elegant and stylish. It definitely looks great for a night under the stars and can be closed up when you want. The metal design of this gazebo is unique and yet still simple. It also has a glass roof so you can look up at the sky and the stars but you’re protected from anything at all. This treehouse style gazebo is definitely fun and it has plenty of doors and glass to experience the outdoors. The metal roof also has plenty to protect you while you’re hanging out in the tub. 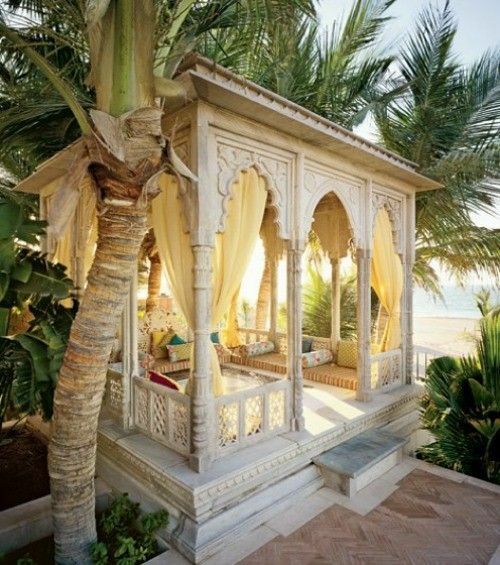 This is an elegant gazebo with the amazing carvings and detail work. 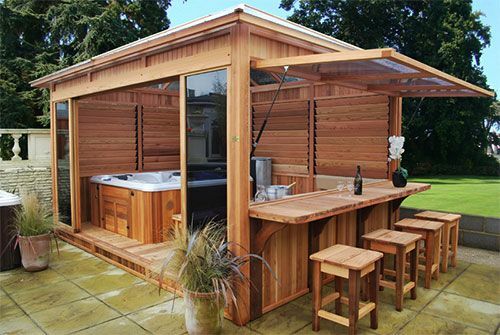 It also has cloth hanging throughout and seating space around the outside of the hot tub. A round gazebo can be fun and this one is large enough to leave seating around the outside. This one has a solid roof and a high surround so you can easily see everything around. This gazebo has slatted blinds that make it easy to see outside but also to protect yourself from any type of weather. You’ve also got the glass roof to see everything and an opening on two sides to see more.